Hello, Angler! Can’t you catch as much as expected or come up empty-handed? Well, most probably you are doing some common fishing mistakes. Thanks to me, as I will here talk about the 10 most common fishing mistakes you should avoid. I won’t disturb you with a boring intro. 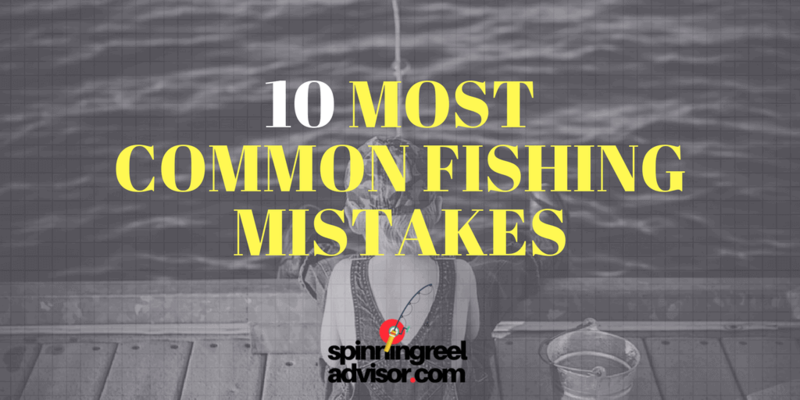 So let’s directly get into those 10 most common fishing mistakes that you shouldn’t do, even by mistake. Lol. The most common mistake of an angler is unpreparedness. Before setting out for fishing, you must develop a plan and take preparation accordingly. Let me give you an example. Imagine yourself in the fishing spot. All on a sudden, you need something but guess what? You forgot to bring it with you. Now how does it make you feel? Angry, right? Exactly, you will feel angry on yourself because of your poorly executed preparation. What you really need to do is; make a list of equipment you need. The best time to collect or manage equipment is just before you are set to go. So before starting the trip, double check the list to reassure that you have packed all the items you will require. While selecting equipment, the very first thing comes first. You have to decide the size of fish you’re targeting. It will take different types of equipment for different types of fish. Suppose you want to catch big fish, then you will need longer root and stronger fishing line. On the contrary, if you are after catching small fish, then going with a smaller rod and a weaker fishing line will be more likely. When targeting smaller fish, most anglers like to use a rod that’s 6-feet in length. And a rod of 7- to 10-feet in length is the optimum choice for bigger fish. Oh, wait! The most important thing, make sure you have charged your trolling motor batteries! Wearing the right pair of shoes, choosing proper clothing, safety precautions, a decent tackle box– these are also part of the preparation. Don’t think that fishes are the fool. I mean, yes they are. But not that much silly to come after just anything. Fishes do notice when something seems odd or out of place. While using fishing lures you should follow the choice criteria that matches with their natural habitat. Suppose you are trying to catch fish in a murky brown pond. Now which type of lure you would like to use? Green plastic frog or brown colored plastic worm? If you don’t want to risk your catch by mistake, you should go with the brown colored plastic worm. Ask me why. Because brown colored plastic worm is seemingly more natural for that specific kind of ponds. And by the textbook, fish are lured naturally. Another important thing is to choose the right lures. But for this, you need to know about the natural condition of the water. Sometimes anglers are in a hurry at the time of selecting lures. Be steady and patient. Because this can turn your fishing trip into an epic fail. Perhaps the common fishing mistake is made by anglers who put old or wrong fishing hook. It will be a matter of regret for you if you are using old hooks to save money. Using a sharp hook is one of the most important criteria in fishing. A sharp hook increases the possibility of your catch. It can easily fit into the fish’s mouth and properly fit your lure or bait. While you are using good lures; fish will bite but because of using dull hook you will miss the fish and also your lure. Which hook is right for you? It depends on your target and the type of lure. When you are targeting big fish; you will need a bigger hook like, a 5/0 size. On the other hand, if you’re planning on catching small fish, then it may need an 8 size hook. Hook types differ in their shape, materials, barbs and points, and eye type. But ultimately it is their intended application which really matters. So pick the right ones for you from bait hooks, fly hooks and lure hooks in the market. The wrong rod and reel may reduce your chances of catching a fish. Selecting the right rod and reel depends on your own fishing preferences. As like hooks, there are many many types of rod and reel out there in the market. The rod and reel used for small trout or large catfish are not same. Keep an arsenal of rods and reels for the different types of fish and fishing. You can easily reel in a tired fish on the boat but don’t do this in a hurry. The shorter distance between you and the fish will make stronger the pull. All rods and reels are changeable. Sometimes rod and reel combinations simply won’t work; they don’t match with each other -because every rod and reel are made on the basis of fishing style. You should purchase that rod which is suitable with reel and your fishing style. You are using the new hook, right lures and a perfect rod and reel combination. But yet you missed your catch. Something is very wrong here. Maybe a problem you are overlooking. Check, if you are using a worn out fishing line. This is one of the most common fishing mistakes as seen in anglers community. Most of the anglers loose their fishes just because of breaking the fishing line alone. If you are using a worn out fishing line, no matter how expensive and perfect combo you are equipped with, don’t expect a better output. The result will be frustrating. So don’t ever consider using the worn out fishing lines. Forget using old, frayed fishing line. It causes you to lose lures and catches every other day. Change your fishing line on a regular basis. If you do so, it will save your favorite lures and baits from losing. Run your fingers over your line regularly to check for friction or nicks and cut off any damaged line you find. Replace old line with braided or monofilament line. Too much slack line is an opportunity for a fish to flee. If your line is too much slack, your control over the line will reduce for certain reasons. It makes easier for a fish to shake loose from your hook. So keep your line enough slack, as much as it requires. Always try to go under 20 percent slack; it makes the fish feel heavier and more fun to catch. On the other hand setting your drag to less than 20-percent of the line, you’re taking a chance on losing your fish. For lines like; a Palomar knot, a uni-knot, or an improved fisherman’s cinch knot are the most used. Even a top quality hook and an expensive line will not work if your knot is a poorly tied one. High breaking strength of knots assures reeling in your targeted fish. At the very last moment; you may lose your fish, only for one reason. And it happens when you want to catch your fish in bare hand. It’s a bitter experience of an angler. It is one of the most painful and costliest fishing mistakes. We know fish is strong and slick. A fish may slip away because of your bare hand. You can use fish-handling gloves or fishing net. Almost each and every animal in this world know how to survive from their enemies. Stepping into the shoes of an angler whether, by hobby or profession, you are naturally a monster devil to the fish. A fish being pulled from a hook after an hour-long battle may be exhausted from the fight, but don’t be overconfident and approach catching it barehanded. At the last moment, it may still play a tough game for self-defense. And anglers often get bitten in the hand(s) or finger(s) in this kinda scenarios. And dirty fish tooth contains germs which can contaminate your skin. So it’s always better to avoid handling the fish barehanded. I know fishing trip with the guys can be a great time pass for you. But don’t forget that your motto is fishing. Gossiping shouldn’t distract your focus from fishing. Don’t tell me that, fishing is not about just catches. We all know that, right? But if you don’t catch a thing, then it isn’t fishing at all for you. Too much talking can take your concentration away and probability to catch the fish. When you’re out on the boat, keep quiet and stay focused. Fishing requires patience and focus on the water. You got to be alert when the bobber goes down, you know. Some bites will be very minimal which require a lot of focus on your line and a steady hand. Nature will give you some clue where the biting is best. But how you will take the advantage depends totally on your personal efforts. Mayfly hatches, cicadas singing, and even the buzzing of flies on a lily pad are the clue to nature. If you don’t pay attention to these clues, stop daydreaming to maximize your catch. Being a fisherman by profession or hobby, we ought to check on some nick nacks before we head for the waters. Such an important catalyst that affects your fishing productivity is the weather condition. If you’ve been fishing for quite a good time, then you already know that the weather is a big player here. Before heading out for a fishing trip; watch the fishing forecast the night before and try to gather information about the location. The condition of weather and sea change rapidly. Make the right decisions regarding fishing locations, target species, tactics and more importantly, your own safety. It’ll be best to hire a guide because a local person has more knowledge about the place than any outsider or visitor. Do some basic study on fishing weather conditions and sort out the best time to go fishing for you. The bitter experience of fishing can turn into happy fishing by avoiding these common fishing mistakes. Next time when you sail out for fishing; keep in mind these 10 most common mistakes. Hopefully, you will return home with a bucket full of fishes, and a memorable moment too. These 10 common mistakes which have been mentioned above, are the ones that make you tired of fishing. Learn to avoid these and you’ll improve your catch. Read another article on Experts Tips on Fishing Safety and Fishing Etiquette.